Noodle bowls can be easily adapted to make use of any vegetables you have on hand. It's a must to have the vegetables for this recipe cleaned and cut well ahead of time, before beginning to cook. Firm and extra-firm tofu are low in FODMAPs because the fiber from the soybeans has been reduced during the tofu-making process. The tofu is then packaged in a water bath, and any remaining oligosaccharides likely soak out of it. Pressing out this water before marinating the tofu helps it absorb the sauce and improves browning. Preheat oven to 400 F. Spray a rimmed baking sheet generously with baking spray or coat with canola oil. In a small bowl, mix 2 tablespoons of water and cornstarch; stir until smooth and set aside. In a small saucepan, combine soy sauce, remaining 1/3 cup water, brown sugar, ginger, mirin, and rice vinegar. Bring to a boil over medium heat, stirring periodically. Boil for 2 minutes. Turn heat down to a simmer, re-mix the cornstarch and water, and drizzle the cornstarch mixture into the hot sauce, stirring constantly. Simmer until the mixture thickens, about 1 minute. Remove from heat and set aside. Over a sink, place the palms of your hands flat on both sides of the tofu block and squeeze gently with even pressure, like squeezing a sponge, until it becomes more difficult to see water coming out. Cut tofu in half lengthwise, then crosswise into a total of 16 pieces about 1/3-inch thick. Place tofu on the prepared baking sheet. Brush each piece with a thin layer of sauce on both sides. Bake until the bottom edges of the tofu have caramelized, 14 to 16 minutes. Turn the tofu pieces over and return to the oven to bake until the bottoms have browned or caramelized on the edges, 8 to 10 minutes more. While tofu is baking, in a large, covered stockpot, bring about 4 quarts of water to a rolling boil over high heat. Add the noodles and return the water to a boil, stirring gently several times to separate the block of noodles into strands. Begin testing for doneness after noodles have boiled about 2 minutes and continue testing at 1-minute intervals. When noodles are tender, pour them into a strainer and rinse with cool water. In a wok or large skillet on medium-high heat, warm canola oil, swirling to coat the pan. When the oil is hot, add garlic, green beans, and edamame and stir-fry for 1 minute. Add carrots and bell pepper and stir-fry for 4 more minutes, or until vegetables just begin to become tender. Remove the garlic cloves and discard (this keeps the dish low-FODMAP). Add the remaining soy sauce mixture to the wok, stir to coat vegetables, and cook about one more minute. Remove from heat and stir in sesame oil and crushed red pepper flakes, if using. Divide noodles into 4 bowls. 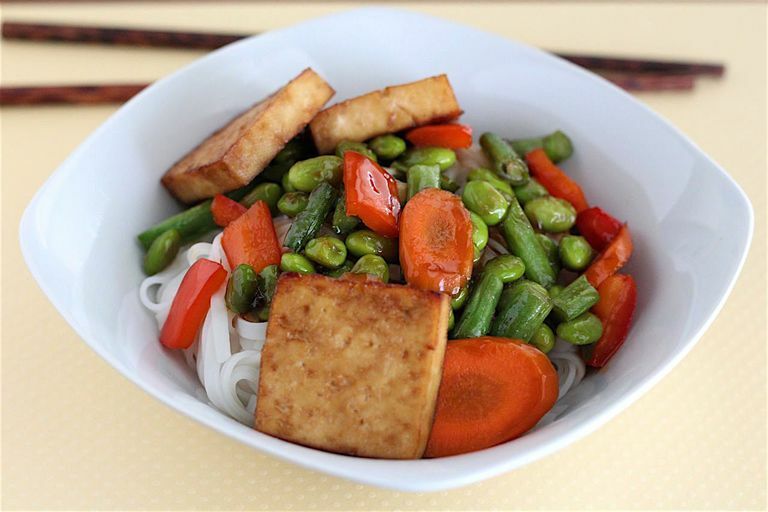 Top each bowl with ¼ of the vegetables and 4 pieces of tofu. Serve with extra soy sauce if desired. For a rice bowl, replace the noodles with 4 cups of cooked rice. Substitute ¾ pound of chicken for the tofu. Instead of baking, dice the raw chicken and stir-fry it in 2 teaspoons of oil until it is fully cooked. Set it aside, and return it to the stir fry along with the sauce just before serving. To make this recipe gluten-free, use gluten-free soy sauce. For extra convenience, use grocery-store prepared fresh or frozen green beans, peppers, and carrots. Sauce can be prepared earlier in the day and refrigerated until it is needed.